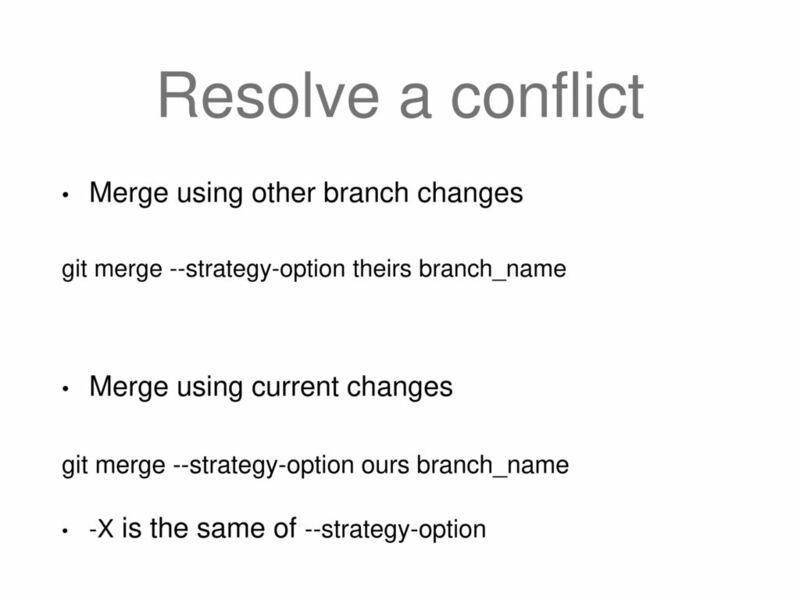 You have two options for integrating your feature into the master branch: merging directly or rebasing and then merging. The general process can be visualized as the following: From a content perspective, rebasing is changing the base of your branch from one commit to another making it appear as if you'd created your branch from a different commit. Just change pick to edit for the commits in question, and do a git commit --amend -s no need to change the original message! Then makes your working tree match the last commit. It is intended to be used to combine history of similar feature branches. Don't take my word for it! To everybody else, it will look like the entire feature was developed in a single series of well-planned commits. Rebasing never merges the commits into the other branch, so merging is still required. So when the feature is rebased, Gerrit can keep track new commit hashes, but same commit message. This only holds for pure git. For simple test projects, it seemed to work fine. The use of -Xtheirs and -Xours appear to be somewhat counterintuitive, so think of it as telling git which branch code to favor when resolving rebase conflicts. Pulling in upstream changes with Git merge results in a superfluous merge commit every time you want to see how the project has progressed. The first step in any workflow that leverages git rebase is to create a dedicated branch for each feature. When using a repository manager, e. This gives you the necessary branch structure to safely utilize rebasing: Local Cleanup One of the best ways to incorporate rebasing into your workflow is to clean up local, in-progress features. Once you've specified commands for each commit in the rebase, Git will begin playing back commits applying the rebase commands. Say I have been doing work on a feature branch and I want to merge in the changes my teammates have made on the master branch. This is how interactive rebasing can keep a project's history clean and meaningful. Its conflict resolution abilities are very limited. Git moves on to the next patch and finds some more conflicts. And no matter how careful, mistakes happen. So if there were no conflict in path, it is already merged this command will do nothing. Most developers like to use an interactive rebase to polish a feature branch before merging it into the main code base. I am quite sure the question aims at the definition of local and remote at this point. Will you have to do the git reset --soft song and dance and try again on a new branch? As with rebase, be careful of the skip situation. A useful example would be to run your codebase's test suite on specific commits, which may help identify regressions during a rebase. Learn more about and on their individual usage pages. Once this is sorted, determine whether this also affects the other sections. Might be useful in more complex situations. Let's go with theirs for hello. Note that this will not incorporate upstream changes into the feature branch. We will explore later in. Then find a directory to work in. Rebasing is a common way to integrate upstream changes into your local repository. In our case, branch1's commits are being replayed on top of master. To incorporate the new commits into your feature branch, you have two options: merging or rebasing. In fact, whenever I get conflicts when trying to do a pull or a rebase, I use to check each one of them to see if I will be able to handle the situation quickly by using some strategy, such as using the --ours or --theirs option. Note, however, that the documentation for git improves continuously, so it is a good idea to read through it to see what's there. This is really important to get a grip on and can help you resolve conflicts much more quickly. The 'explicit' part is that they create a new merge commit. Using git reflog these commits can be restored and the entire rebase can be undone. It is important to note that the meaning of ours and theirs is reversed from its normal meaning when being used for a rebase. The gives the most information about the conflict resolution process. Quite often I find myself in a situation when I need to rebase my local feature branch containing the latest code against the master, but running git rebase master generates a bunch of conflicts that I am expected to fix manually, though I know that my local feature branch has the latest and greatest and I simply want the changes in my feature branch overwrite the corresponding files in master each time such conflict arises. The option toggles display of visual diffstat content that shows what changed since the last debase. Rebasing is the process of moving or combining a sequence of commits to a new base commit. In other words, the sides are swapped. The real danger cases arise when executing history rewriting interactive rebases and force pushing the results to a remote branch that's shared by other users. You can right-click on conflicts in the bottom pane and select which version you want. To begin an interactive rebasing session, pass the i option to the git rebase command: git checkout feature git rebase -i master This will open a text editor listing all of the commits that are about to be moved: pick 33d5b7a Message for commit 1 pick 9480b3d Message for commit 2 pick 5c67e61 Message for commit 3 This listing defines exactly what the branch will look like after the rebase is performed. My two recent unshared commits are at the top of the history, and the rest is the history of master when I originally checked out this branch. The mergetool should write the result of the resolution to this file. Running rebase in interactive mode and executing subcommands like squash or drop will remove commits from your branche's immediate log. Git Rebase Standard vs Git Rebase Interactive Git rebase interactive is when git rebase accepts an -- i argument. Because rebase is rewriting the commits, all sorts of alterations can be made; such as changing the commit message, squashing commits together, even splitting commits! This post was originally posted on my personal In the you were presented with a basic workflow used to automatically handle merge conflicts. Since commits B and C are based on commit A, there is nothing to be done, and the rebase is a no-op.